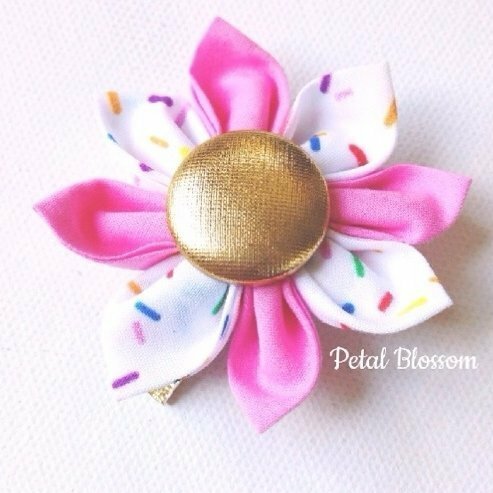 A cute, trendy hair accessory for your little girl, featuring our gorgeous sprinkle fabric. The fabric flower has 8 hand sewn petals in a mixture of pink and sprinkle fabric, with a metallic gold button in the centre. A must have for any ice cream loving girl, big or small! 6 cm flower on a non slip alligator clip. 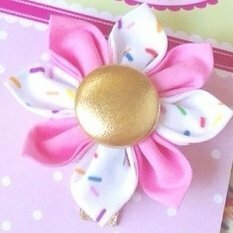 These hair clips make for great birthday gifts of Christmas stocking fillers.